Makeup for dry sensitive skin is usually free of fragrances and contain fewer chemicals and preservatives than other cosmetics. Frequently allergic to skincare products, makeup, laundry soaps, softeners, etc. Recognizing you have dry sensitive skin is the easy part. Learning to care for sensitive dry skin is a little more difficult because each person's sensitivities are unique to them. You have to find what works for you.When choosing a facial cleanser, be sure to purchase a line that does not contain alcohol. Look for hypoallergenic brands designed for sensitive dry skin. The ideal cleanser should include moisturizers and ingredients that bring about pH balance. If your skin has a dry, tight feeling (or worse) after using the product, it is not right for your skin. Try another product until you find one that leaves your sensitive skin feeling hydrated and smooth. Recommended for dry sensitive skin. A hydrating mask is another way to help moisturize and sooth your sensitive face. 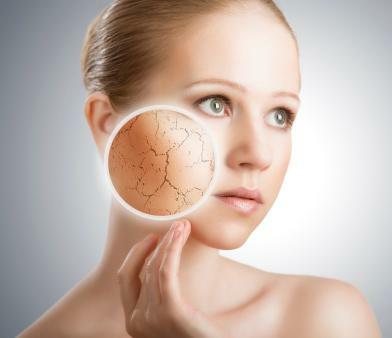 People with dry sensitive skin often feel they should not exfoliate. This is not true. The trick is to find a gentle exfoliant and use it once or twice a week. Once you've cleaned and moisturized your skin, it's important to apply makeup for dry sensitive skin if you want to prevent symptoms from returning. When shopping for your makeup search the labels for words like hypoallergenic, non-comedogenic or wording that tells you the product is appropriate for dry sensitive skin. A silicone-based, hypoallergenic liquid foundation that contains sunscreen protection of at least SPF 15 is ideal. Use a makeup sponge to apply and don't rub it into the skin. Not all people with sensitive skin can tolerate facial powder. If you do plan to wear it, be sure to buy a line that is fragrant-free. Micabella's mineral makeup is one option. This line is made up of pressed natural minerals and contains no preservatives, dyes, oils, or irritating fillers. It is extremely gentle but still doesn't work for everyone with sensitive skin (and can be a bit pricey, too). Eye makeup doesn't always bother sensitive skin as long as it is fragrance free. However, for those who do need to be cautious, Physicians Formula carries a whole line of makeup including eye makeup appropriate for sensitive skin.